That's been in Minnesota too long, needs some sun. Or, stay away from the flour bag when you're sneezing...that IS flour, right? Thing is on drugs, really dilated! I've looked over those drawings about the ufo's and how they're constructed. I've figured the answer to my question. These craft are so fast, use wormholes, folded space, warp drive, etc....that they don't need bathrooms. They come here, harass us, then speed home. The other option is they wear Depends. Assuming they eat, of course. Yeah, the guy that played Jaws, Richard Kiel, in James Bond movies was the big alien in this Twilight Zone episode...to Serve Man. LAS VEGAS - Former Nevada Senator Harry Reid is calling for formal congressional hearings probing the enduring mystery of UFOs. "Some people say, why is Reid doing this? He doesn't know anything about science. Well, I'm doing it out of sheer curiosity," Reid said . 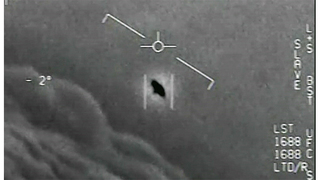 Harry Reid's interest in UFOs dates back 30 years, but he kept it quiet until Dec. 2017 when the New York Times reported about the Advanced Aviation Threat Identification Program (AATIP), a secret Pentagon study of UFOs and related phenomena, initiated by Reid and two other senators. Documents related to AATIP and its offshoot -- Advanced Aerospace Weapons Systems Application Program (AAWSAP) -- do not mention UFOs , ET's, or little green men, and Reid has been careful to avoid the tabloid slant. Reporter George Knapp: "You've used that quote about 'It's not little green men.' We don't know, we don't know what it is or where they are from?" Harry Reid: "We do not know. What I have learned is, you can't just hide your head in the sand and say these things are not happening. We have military installations where hundreds and hundreds of people who are there and see these things." Dramatic military episodes involving highly-advanced but unknown intruders, such as a fleet of so-called gimbal craft in 2015 or the 2004 incursions by large tic tac's more than justify an ongoing study, Reid said. "As I said, this is a worldwide phenomenon. It's not just here in the United States. There are certain places we don't understand why but there are more occurrences and have been for a long long time." 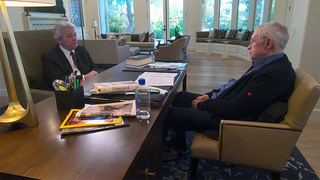 The study based in Las Vegas explored topics far beyond the nuts and bolts of flying saucers. Physicist Dr. Hal Puthoff assigned 38 topics to academics and experts, tasking the authors to project to the year 2050 and speculate on what our cutting-edge technology might become. UFOs, whatever they are, have already demonstrated some of what is possible. In July 2018, the I-Team first released the list of those papers. Two weeks ago, the Defense Intelligence Agency confirmed the list when it released a letter from late Senator John McCain, who had requested all available materials from AATIP for his armed services committee. Reid and McCain were from different parties but were close. "Sure, John knew what I was doing. He didn't hide the fact that he was interested also. It's why he wrote the letter." Media critics have griped that the papers explored fringe science. That was the assignment, according to Dr. Puthoff. One publication explores invisibility cloaking -- craft that are not only invisible to radar, but actually invisible. That research has reportedly been underway at Nevada's Area 51 base in recent years. Another paper by a UNLV engineer explored how to detect and track hypersonic objects, things that traverse earth's atmosphere at incredible speeds, similar to hypersonic missiles Russia's military now claims to possess. Reporter George Knapp: "It could tell us about UFOs but also Russian missiles, so it has practical benefits." One of the papers on the AATIP list focused on metamaterials, exotic compounds that could explain the physics of UFOs. Since AATIP ended, private groups such as To The Stars Academy have scoured the planet, seeking bits and pieces of supposed wreckage for testing. Former Pentagon intelligence officer Lue Elizondo is spearheading that effort. In 2009, Senator Reid tried to turn AATIP into a special access program, in part so it might gain access to evidence that has not yet been made public. Reporter George Knapp: "It suggests there might be other studies and programs that might shed light on this?" Harry Reid: "Other programs that have been done and information they have, including different pieces of evidence." Under Senate rules, Reid was prohibited from lobbying his former colleagues for two years. That time limit expired earlier this month and he's been making calls to key people in Washington about this issue. 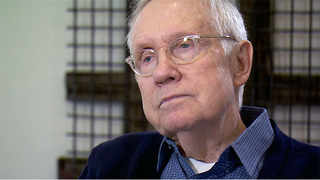 The I-Team asked Senator Reid if he thinks it is time for an official disclosure about UFOs. Here's his answer. Yeah, they call it a BMW. Look at Robert Lazar's W-2 and the ID with his picture. It has on them "United States Department of Naval Intelligence/U.S. Department of Naval Intelligence" There's a Department of the Navy and within it there is the "Office of Naval Intelligence" As far as I can find out there is no United States Department of Naval Intelligence. as I can find out there is no United States Department of Naval Intelligence. I've learned when it comes to government just because it is not common knowledge does not mean it does not exist. Avi Loeb's theory about an alien spaceship has made the rounds in the media and caused controversy in the academic community. Before he started the whole alien spaceship thing last year, the chairman of Harvard University 's astronomy department was known for public lectures on modesty. Personal modesty, which Avi Loeb said he learned growing up on a farm. And what Loeb calls "cosmic modesty" - the idea that it's arrogant to assume we are alone in the universe, or even a particularly special species.
" 'Oumuamua is not an alien spaceship, and the authors of the paper insult honest scientific inquiry to even suggest it," tweeted Paul Sutter, an astrophysicist at Ohio State University , shortly after the paper published. "A shocking example of sensationalist, ill-motivated science," theoretical astrophysicist Ethan Siegel wrote in Forbes. North Carolina State Universityastrophycisist Katie Mack suggested Loeb was trolling for publicity. "Sometimes you write a paper about something that you don't believe to be true at all, just for the purpose of putting out there," she told the Verge. "It changes your perception on reality, just knowing that we're not alone," he says. "We are fighting on borders, on resources. . . . It would make us feel part of planet Earth as a civilization rather than individual countries voting on Brexit." Avi Loeb said the existence of aliens "would make us feel part of planet earth as a civilization rather than individual countries voting on Brexit." As he tells it, his life story sounds like a cerebral version of "Forrest Gump" - Loeb always singemindedly pursuing his science and intersecting with the giants of the field, whom he regularly name-drops. Stephen Hawking had dinner at his house. Stephen Spielberg once asked him for movie tips. Russian billionaire Uri Milner once walked into his office and sat on the couch and asked him to help design humanity's first interstellar spaceship - which he is now doing, with a research budget of $100 million and the endorsement of Mark Zuckerberg and the late Hawking. That was one of the first things that crossed my mind. But I'd still like to see something that shows a Department of Naval Intelligence exists. Have you ever heard Ralph Rings story? Ralph Ring worked with Otis Carr. His claim is they built a flying disc with a magnetic propulsion system. True or not, I have no clue. His story is fascinating though. He says they were ready to go to production when the government shut them down due to "A Threat to US economy". Obviously, if true, the technology would replace many things in the world. Amazing how much governments stifle the progress of man, isn't it? Imagine what advanced secrets sit in the back pockets of government!! Yup,. You must be familiar with Steven Greer. Who talks about Zero Point Energy. THE DISCLOSURE PROJECT and SIRIUS. Yeah, Like the carborator that allows gasoline vehicles 200 miles per gallon. Yes, exactly. I also heard of a carb, (may be the same you are refering to) that steam cleaned itself, allowing better gas mileage. The inventor was convinced to sell out .